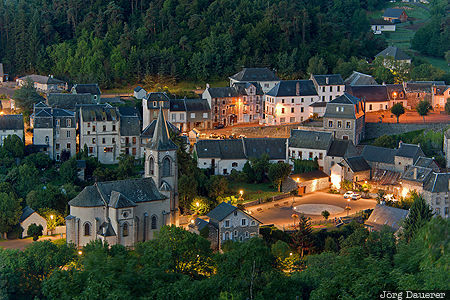 The village Murol with its church at the blue hour before sunrise illuminated by street lamps seen from Chateau de Murol (the castle of the village). Murol is in Auvergne in the center of France. This photo was taken in the morning of a sunny day in September of 2015. This photo was taken with a digital camera.